I think DC Fiona Griffiths must be one of the most original fictional detectives I’ve come across. She is the creation of Harry Bingham in Talking to the Dead. She is Welsh, single and at the start of the book is aged 26, being interviewed for a job with the South Wales Police in Cardiff. She had a degree from Cambridge where she studied philosophy (a prize winning student). However, there is a problem as she has a two year gap in her CV around the time of her A Levels and she doesn’t want to talk about it. But as Human Resources have passed her OK, she gets a job. Even worse she gets obsessed, throws herself into finding out the truth with no regard for her own safety and without calling for backup, or referring to senior officers. And she’s clearly still suffering from whatever it was that caused the gap in her CV. But on the other hand she is a brilliant researcher and has great instincts and intuition. She focuses on the credit card found at the scene of the murders, fascinated by the fact that it had belonged to a millionaire who had been presumed dead after a plane crash over the sea (his body had never been recovered), convinced it is a vital clue. There are two strands to the mystery, as alongside the Mancini murders Fiona is investigating ex policeman Brian Penry, a bursar at a Roman Catholic boys’ school, who had stolen money from the school. And there is also a mystery surrounding Fiona and her family, which is only partly revealed at the end of the book. I really should not have liked this book as much as I did as it’s written in the present tense, solely from Fiona’s viewpoint. But I loved it and in this book was completely at ease with the present tense. It’s also quite strange in parts as we see further into Fiona’s mind; she has difficulty connecting with her feelings and with other people and some of her thoughts and actions are strange and disturbing. Whilst it is not an overtly violent book it is a dark book in places and there is an amount of gruesomeness involved (but I didn’t have to avert my eyes, as it were, or skim read any of the book). I had an idea about Fiona’s trauma, as I’d come across a similar case in another crime fiction novel, but I don’t want to spoil the book for others by saying what it is. I will most certainly look out for the next book in the series – there are now 5 Fiona Griffiths books and I think these are books that should definitely be read in sequence. The locations are well grounded, there is a definite ‘Welsh’ feel and atmosphere and the characters are well defined. See Harry Bingham’s website for more information about him and his books – he’s written others as well as the Fiona Griffiths books. 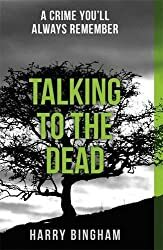 Talking to the Dead is my second book for the 20 Books of Summer Challenge and the 24th for the Mount TBR Reading Challenge, completing the second level. So glad you enjoyed this so well, Margaret. And it’s interesting about the present tense. I usually don’t care much for it, either, especially if the author is also using first person. But every once in a while you meet an author who does it well. I am not a fan of crime fiction. But you’ve got me intrigued by Fiona and now I want to know more about her. Too many books, so little time!